Before his team broke the huddle for the decisive fourth quarter of Friday’s MIAA A Conference lacrosse opening round match against St. Paul’s School, Severn School coach Jamie McNealey relished the moment. “Where would you rather be,” said the Admirals coach to his troops, who were tied with the Crusaders. Several times during the regular season, Severn entered the final frame of regulation with victory within reach, only to find disappointment. The Admirals grew only stronger through the pain, and Friday, were finally able to breakthrough. The sixth-ranked Admirals defeated No. 3 St. Paul’s School, 8-5, at Tullai Field in Brooklandville. 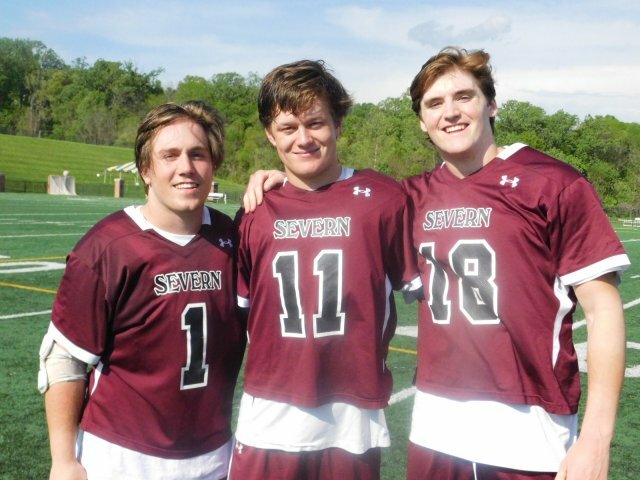 Junior attack Michael Lamon had three goals and an assist for Severn (16-6 overall), and Tyler Perreten added a hat trick. Joe Pollard and Patrick Karey each recorded a goal and an assist for St. Paul’s (12-7). The Anne Arundel County school scored the game’s final three goals to gain its first league semifinal berth since 2001. Monday evening at 7:30 at Johns Hopkins University’s Homewood Field, the sixth-seed Admirals will take on No. 2 seed and second-ranked Boys’ Latin School. Last month, the Admirals had a five-goal lead on BL, but faded in the fourth. They had a 7-4 advantage in the fourth against Loyola Blakefield, only to lose. Severn nearly climbed out of a 9-4 hole against the Crusaders before falling, 9-8. Friday, McNealey said the Admirals were able to put together a complete 48-minute effort. Perretten broke a 5-5 tie, cutting the middle to receive a pass from Lamon and put a shot into the upper right past Crusaders goalie Alex Rode with 8 minutes, 35 seconds remaining in regulation. The series was setup by Liam McFaden checking the ball away from a St. Paul’s player in front of the Admirals’ sideline. The Admiral defense with senior netminder Tyler Gilmore (5 saves) nursed the lead. Despite turnovers off several deep clears – the kind of mistakes that haunted them in those regular season losses – Severn overcame them Friday. Lamon got a pass from Charlie Olmert and ripped a shot past Rode, pushing the Admirals’ advantage to 7-5 with 1:41 left in regulation. St. Paul’s gained possession off the ensuing faceoff, but McFaden checked the ball away from Karey and Perreten put on the exclamination point with an empty goal drop in with 43.2 seconds left. In a cat-and-mouse match with both defenses playing zone, Severn got scores from Lamon and Olmert in the closing 2:21 of the opening quarter for a 2-1 advantage. The Admirals grabbed a 3-1 advantage off Andrew Volk’s putback of an Olmert shot off of Rode’s stick. Down 4-2 at halftime, St. Paul’s shifted momentum in the third. Pollard scored unassisted early then, with 1:25 left, found Mitch Gordon who laced a moving shot past Gilmore, tying the game. After Lamon regained the lead for Severn early in the fourth quarter, St. Paul’s answered as Logan Posner converted in extra-man. The Admirals, playing in their first playoff game since 2012, made the plays over the final nine minutes, bringing a shocking end to St. Paul’s season. The Crusaders, who overcame a 0-2 start, began the week with a chance to gain the No. 2 playoff seed and a bye into the semifinals in the nation’s toughest boys’ lacrosse league. “You’re so on the edge for three months and now, all of sudden, it’s so anticlimatic,” said St. Paul’s coach Rick Brocato. “It’s a big letdown. The Admirals, now owner of the Cinderella-moniker, next has Boys’ Latin, which defeated them 8-7 last month on Water Street after leading 5-0 in the first quarter. Last year, Severn went 0-9 in the MIAA A play. Now, the Admirals are two wins away from their first lacrosse championship since 1968.